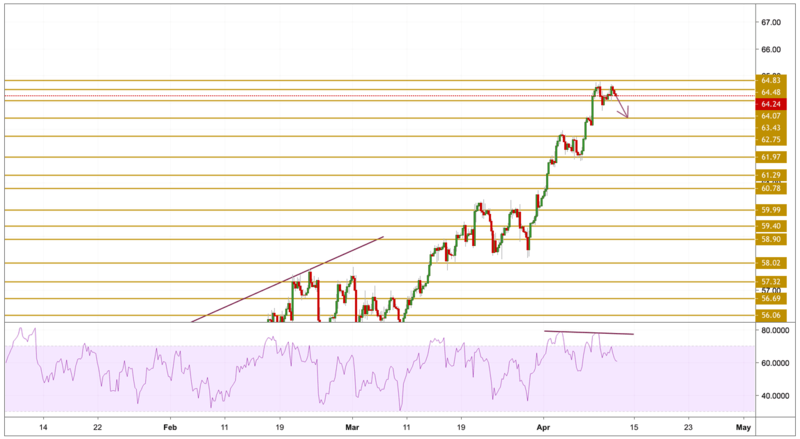 WTI has been struggling near the five-month high as API and EIA both confirmed higher inventory levels whereas sluggish global GDP forecast from the IMF also played its role in dragging the back gold downward. API Crude oil stocks grew 4.091 million from 2.963 million prior whereas EIA inventories crossed 2.294 million market consensus with a 7.029 million figure. Adding to this, the US Dollar came back on the market demand as investors dropped their bids on commodities amid sluggish China data whereas positive news on the US-China trade front further strengthened the greenback. Crude prices went back up and tried with no success to break once more to the upside, but the cap is set at the previous five-month high. Now again, the price is headed downwards and is clearly loosing momentum as we can see on the RSI. A bigger correction is most probably set to happen and we will be focusing on the $63.43 support level.